Serve with mash and peas or on a sandwich. Nori is a sea vegetable usually wrapped around sushi - those black sheets! It's a tasty food that is also a good source of protein, calcium and vitamin A. It's available in larger supermarket branches, Oriental grocers and health food shops as well as online. Plain firm tofu - medium firm, firm or extra firm - is best pressed in this recipe if you have time. See our tofu guide Plain firm tofu is slightly more rough textured and is usually used in stir-fried and the like - very different from softer, creamier silken tofu. Well-known brands of firm plain include Cauldron, Dragonfly and Pulmone. Vegan mayonnaise (for tartar sauce): Follow Your Heart Vegenaise; Plamil - and lots of other brands. Or make your own cheaply and quickly - click here for our popular Aquafaba Mayo! And for busy days and evenings... ready-made versions as pictured! Preheat the oven to 200°C/400F°/Gas Mark 6. Line a baking tray with baking paper and lightly coat it with olive oil or oil spray. Set aside. Make the coating mixture. Blend the polenta/white flour, almonds, paprika, nori, salt, onion and garlic powder, dill and black pepper until most of the almonds have turned into a coarse meal, with a few larger pieces remaining. Pour it all into a wide baking dish or similar. Place the plant milk into a bowl next to the coating mixture. 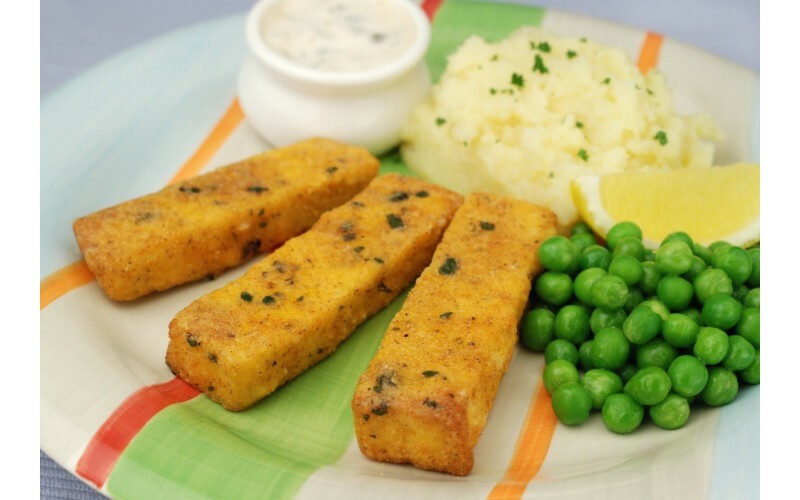 Cut the tofu into fish finger-shaped slices – they should be about 1cm/just under ½ inch deep. Working with one piece at a time, dip the tofu into the plant milk then toss gently in the coating mixture until evenly coated. Place tofu fingers on the prepared baking sheet. When they are all done, sprinkle lightly with olive oil or oil spray. Bake for 15 minutes then turn and bake for another 15 – or until crispy. Transfer to a plate and squeeze some fresh lemon juice evenly over the tofu fingers. To make the tartar sauce, just mix all the ingredients together thoroughly while the tofu fingers are baking. It will keep in the fridge for at least a week or more.